The Open Season Pro Folding Skinner is handcrafted by Buck Knives and features original artwork of an elusive bobcat, illustrated by wildlife artist Naomi McCavitt. The tip is narrow, while the wide curved belly gives a nice skinning sweep. The Open Season Pro Series is a combination of the best tools necessary for a successful hunting season. Offered in S30V steel with a contoured Rosewood Dymondwood handle, the series is a right fit with a deep-pocket clip for the serious hunter or outdoor enthusiast. Larry Oden, Vice-President, Buck Collectors Club, states “The S30V steel edge holds a great edge." The knife also includes a clip to keep it near you when needed! The 2017 Virginia Wildlife knife will include an elegant, made-in-Virginia solid cherry box beautifully inlaid with a bobcat and its habitat. 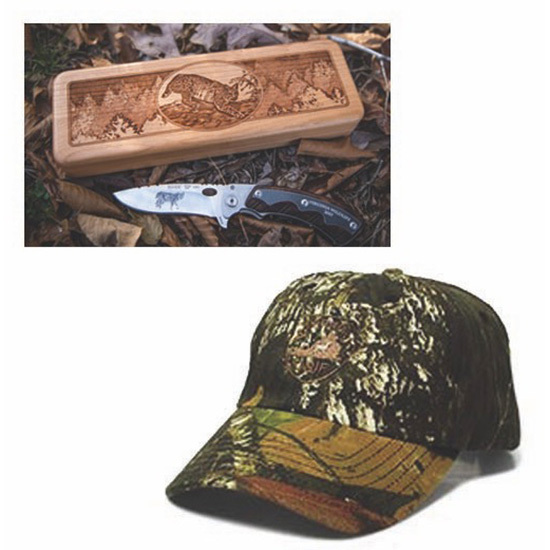 And, while supplies last, enjoy your FREE Mossy Oak hat with your knife purchase!